Habit: Plant <= 12 dm, unarmed. Stem: unevenly tomentose, becoming +- glabrous in stripes below nodes. Leaf: main leaves 5--10(20) mm, narrowly awl-shaped, ascending to appressed, sparsely woolly or becoming glabrous; clustered leaves 3--10(15) mm, thread- to +- club-like, glabrous. Inflorescence: heads generally 3--7; peduncle generally 5--10 mm, bracts 0; involucre 7--10 mm, obconic; phyllaries 4, lanceolate to obovate. Flower: 4; corolla 9--10 mm, cream to golden yellow. 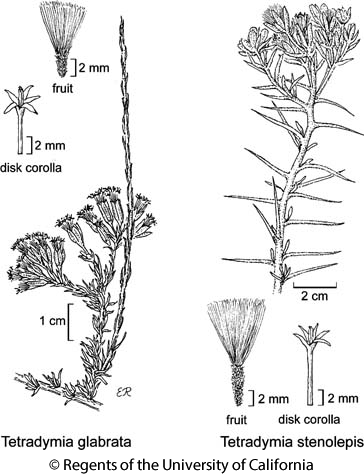 Fruit: generally 3--4 mm, short-stiff-hairy; ribs glandular; pappus of many fine bristles, 6--8 mm. Chromosomes: 2n=60,62,120,180. Citation for this treatment: David J. Keil 2012, Tetradymia glabrata, in Jepson Flora Project (eds.) Jepson eFlora, http://ucjeps.berkeley.edu/eflora/eflora_display.php?tid=5295, accessed on April 25, 2019. GB, w DMoj; Markers link to CCH specimen records. Yellow markers indicate records that may provide evidence for eFlora range revision or may have georeferencing or identification issues. Purple markers indicate specimens collected from a garden, greenhouse, or other non-wild location.